Even though God had given the People of Israel the land of Canaan, they often sinned by worshiping false gods. For this God would punish them. As a punishment, God did not send any rain to the land of Israel. For a long, long time it did not rain and nothing could grow. Soon there was no food for the people and the animals to eat. Some of the people had to go to other lands to live. One man who lived in Bethlehem took his wife Naomi and his two sons to a strange land. In this land there was enough food but the people there did not love God. They prayed to other gods. But the man and his wife prayed to the Lord God, and they taught their sons to worship him too. Some time later the man died in this strange land. His wife Naomi and his two sons were left there alone. But the sons had found wives in this land. One of the wives was named Orpah and the other was named Ruth. Ruth learned to love and serve God. After about ten years, the sons also died. Now Naomi and Orpah and Ruth were all alone. They had no one to make a home for them. Then Naomi heard that the Lord had once again sent rain to Canaan. Now that there was enough food for the people to eat, Naomi wanted to go back to her home. Ruth and Orpah said to Naomi, "We will go with you to your home in Canaan." As they were on the way, Naomi said to Orpah and Ruth, "Go back to your own land, and live in your mother's house again. I hope that God will be as kind to you as He has been to me." Orpah kissed Naomi goodbye, and she went back to her own people. But Ruth stayed with Naomi. Naomi said to Ruth, "Orpah has gone back to her people. You should go back too." "Oh, do not ask me to leave you," Ruth answered. "I will go wherever you go and live with you there. I will be a part of your family and worship your God. I will die in the same land that you die in and be buried there. We will stay together as long as we live." So Ruth stayed with Naomi, and they both went back to the land of Canaan together. They came to Bethlehem just when the grain was ripe in the fields. Workers were cutting the grain and putting it into the barns. 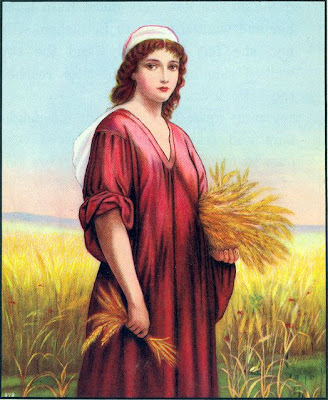 Ruth went into the fields to pick up the grain that the workers had dropped. 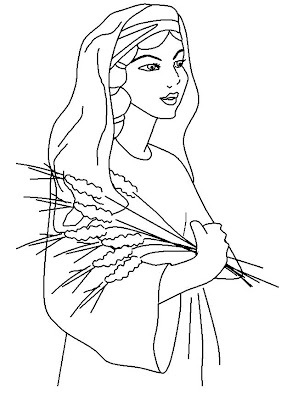 She used this grain for food, so that she and Naomi would not be hungry. The field Ruth worked in belonged to a rich man named Boaz. One day Boaz asked one of his workers, "Who is the strange young woman who is working in my field?" The worker said, "Her name is Ruth. She is the girl who came back with Naomi." Boaz went to talk to Ruth. He said, "Stay and work in my field. When you are hungry or thirsty, you may eat and drink with my workers." "Why are you so kind to me?" asked Ruth. "You don't even know me." Boaz answered, "I have heard how kind you were to Naomi. You left your father and mother, and you left your own land to come to this strange land. You trust in the Lord, and He is blessing your work. When Ruth had gone back to work, Boaz told his workers, "Be very kind to Ruth. I want her to have more grain than she is getting now. Let more of it fall to the ground, so that there is more for her to pick up." Every day Ruth worked in the fields that belonged to Boaz. He learned to love Ruth, and he married her. Ruth and Boaz had children and grandchildren. King David came from their family and many, many years later, Jesus, the Savior, was born of David's family.